The head company is located in Slovenia, European,Qualis D.O.O. 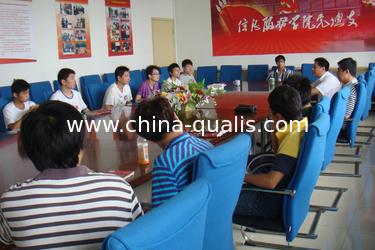 was established at 1996,Wuxi Qualis Automation Technology Co.,Ltd. is establishing the Liyuan Development district,Wuxi City Jiangsu Province,which is specially design,develop,manufacture and sale the automatic NON-standard equipment. 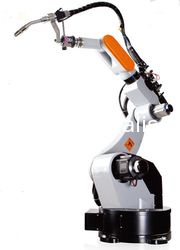 At the same time,Qualis also agency the lead brand products,such as Nanjing Panda Welding robots,which could used in welding steel industry(for example,bed frame,car frame,components etc.). Also agency the yaskawa traction motors,which is widely used in elevator. Professional production: all kinds of mechanical, electronic, pneumatic and other non-standard automation equipment. Service tenet: the company spirit of "people-oriented, good faith for the honor" for the purpose; to high-tech enterprises to build international competitiveness as the goal, forge ahead to the frontier science and technology era; constantly improve themselves brand at the same time, also strengthened the training quality talents of high-tech. We welcome ambitious, have the ability, has the goal of partners to join, and we work together to create another milepost in the era of science and technology! Our Qualis arm to finish the customer`s special requirement. In China,we mainly focus on the automatic system,such as automatic welding,CNC cutting.We do our best to meet the workpiece requirement,make customer be satisfied. Our sales will guide you to finish international business step by step if you are not so familar with international cooperations. Professional Mechanism Deisner and Engineer to suggest and design the proper drawings and best and economic proposal according to workpiece specifications and customer requirement. Professional Electronic Engineer to choose and suggest the best quality electronic parts for every electric units to equip with the machinery. Professional Purcahser to order the best quality and most competitive parts for every customers. Professional Documents department to deal with the export&import documents for cutomer,you needn`t worry about the clean customs because of the documents problems. We have long-term cooperation sea/air forwarder,we always choose the best way and economic shipping way. We also has professional team on the aboard to design the elevator,elevator controll system. We could design and manufacture the automatic system,here we list several project for your reference. 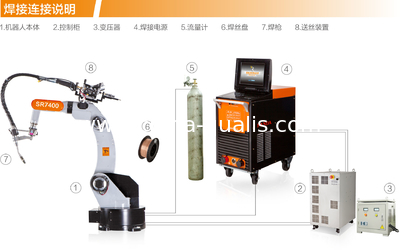 This equipment is mainly composed of two sets of industrial robots, two sets of gas shielded welder, a dual drive of three-axis rotary positioner and control systems, mainly for the workpiece automatic welding.